Soros Fund Management has doubled up a bet that the S&P 500 SPX is headed for a fall. Writing on the Bullion Baron blog, Joseph has been quick to alert readers to the hedge fund’s bets on the S&P 500, offering up a summary of changes to that call from mid-2011 onward. For the four quarters of 2013, that short has followed a pattern of big highs and big lows. Of course, Joseph said, the bearish S&P call could be a hedge and, as it’s six weeks into the next reporting period, it may have already been reduced or increased. 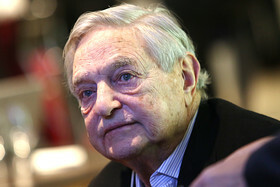 But he said it could also be indicative of jitters: In January, Soros highlighted risks coming out of China and drew a comparison with the lead-up to the crash of 2008. The second- and third-biggest positions in the 13F were a fresh put on the Energy Select Sector SPDR fund and a big jump in holds of Israeli pharmaceutical maker Teva TEVA . 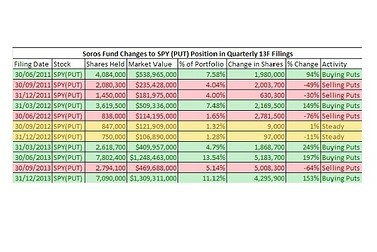 Read about more changes in Soros’s quarterly holdings here. Soros and his hedge fund aren’t alone if they’re feeling unease at the bull run for markets. It’s been roughly 28 months since a substantial correction for the S&P 500, which is down 0.5% for the year after having endured a pullback earlier this month, triggered in part by jitters over emerging markets. Strategists have been debating about when and how the correction is going to happen. As for whether investors should ape the 13F followings of others, MarketWatch’s Bill Watts pointed out last week that the 45-day lag in the holdings is particularly tricky when it comes to calls like a huge bearish bet on the S&P 500. And he found that while hedge funds outperform on the upside, they do far worse on the downside. It was Soros himself who famously once said: “I rely a great deal on animal instincts.” And as we all know, George’s made some big, crazy, winning bets in the past.